Flipboard, the free ‘personalized magazine’ has been updated and now works on iPhones as well as iPads! For me, Flipboard was the first killer app for iPad so it’s great news that it’s now universal. 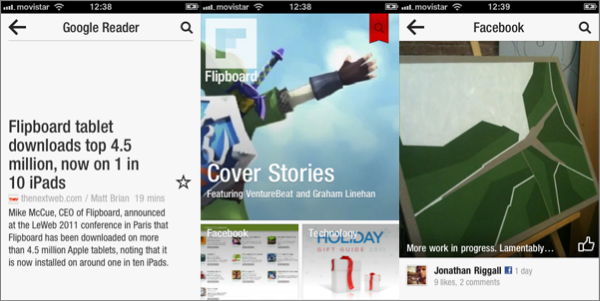 Flipboard is a ‘social magazine‘. Essentially it collects Twitter, Facebook, partner publishers and RSS feeds together to make a very attractive way of browsing articles on an iOS device. The new feature for iPhone is ‘Cover Stories‘, which selects the most interesting stories of the moment based on what you most commonly read. You can alter this by muting some authors (or Twitter users, Facebook friends, etc. ), and adding other content to Flipboard. I’ve been using it for a morning, and it’s already feeling much more personal. I would like the option to mute whole services for Cover Stories as, for example, tweets are rarely pretty enough. Once you’ve personalized Flipboard, you’ll get the stories and social media you want collected in Flipboard’s excellent interface. Although there is a search, it’s not always the easiest application to find your way around. However, it’s worth getting used to as it really is a lovely app for reading. Read our review, and download the free universal iOS app here.